← Who are the NeCTAR research community? 14 new environmental layers now available within OzTrack! The OzTrack team are proud to announce that 14 new environmental layers have been incorporated into the OzTrack website. These layers may be queried from within OzTrack to provide spatial and temporal information on habitat preference and reserve design. Along with Bathymetry and Elevation data obtained from General Bathymetric Chart of the Oceans (GEBCO), a map of Australian Natural Resource Management (NRM) Regional Boundaries is provided as well as a map of fire frequency using data from the NOAA Satellite Information System. 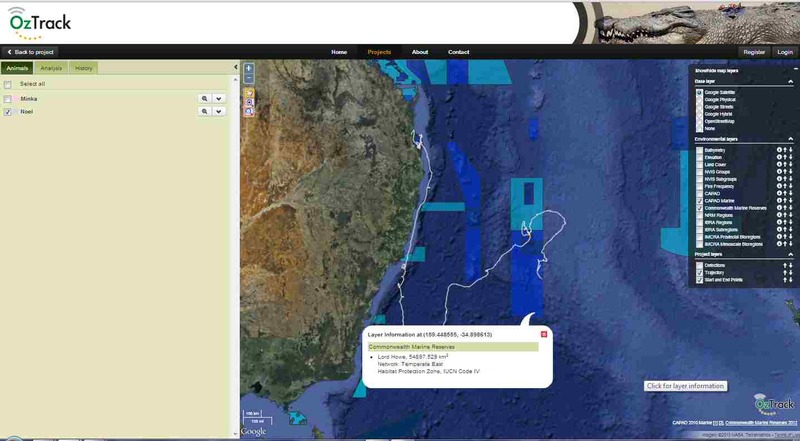 Your animal tracks may now be overlayed on maps of terrestrial and marine protected areas from CAPAD 2010 and Australia’s network of Commonwealth Marine Reserves. This may allow wildlife managers to investigate whether the current design of these areas is sufficient to protect their study species. We have incorporated land-use data from Australia’s Dynamic Land Cover dataset which reflect the structural character of vegetation. These range from cultivated and managed land covers (crops and pastures) to natural land covers such as closed forest and open grasslands. With the National Vegetation Information System (NVIS) Groups and Subgroup layers, we provide the latest summary information (November 2012) on Australia’s present native vegetation. 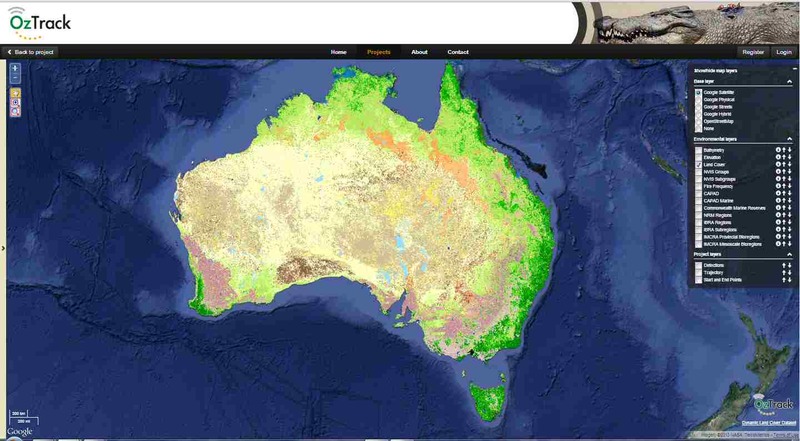 The input vegetation data were provided from over 100 individual projects representing the majority of Australia’s regional vegetation mapping over the last 50 years. Data were obtained from the Environmental Resources Information Network (ERIN), Department of Sustainability Environment Water Population and Communities. Finally the IBRA (Interim Biogeographic Regionalisation for Australia) regions and subregion layers, and the IMCRA (Integrated Marine and Coastal Regionalisation of Australia) provincial and mesoscale layers may also be visualised. These represent spatial units that contain broad patterns in biodiversity in the terrestrial and marine environment. It is our hope to add more environmental layers to http://oztrack.org in the coming months. I am a Post-doctoral Research Fellow at the School of Biological Sciences, University of Queensland. My research focuses on both fundamental and applied aspects of ecology, including habitat use, foraging behaviour and human-wildlife conflict. My research investigates the drivers of animal movements, space use and community structure. This has included conducting population surveys (by land, boat and aircraft) or using biotelemetry (i.e. VHF radio, GPS and ARGOS satellite telemetry, light-based geolocators (GLS) and underwater acoustic transmitters) to gather data on species abundance, distribution and habitat use. These data are used in combination with environmental data to test hypotheses and make predictions in order to inform species management. I have worked closely with local government, NGOs and industry partners to ensure these survey data are used to achieve positive conservation outcomes and/or improve species management. I possess strong GIS skills and have 8 years of experience of coding in the R programming language. I have developed two open-source spatial analysis packages in R, and am one of the original developers of OzTrack.org, a web-based platform for the analysis and visualisation of animal tracking data. This entry was posted in Uncategorized and tagged analysis tools, animal tracking, Environmental layers, OzTrack, Ross Dwyer, telemetry. Bookmark the permalink. Why should you share your hard-won animal telemetry data? 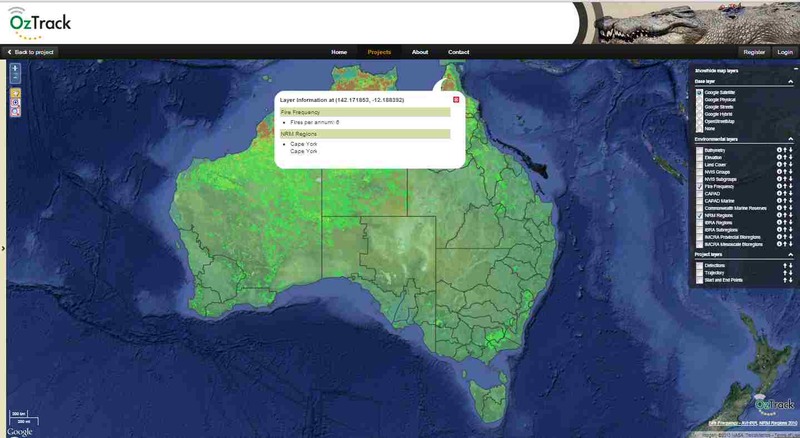 OzTrack.org to feature at AWMS and ECOTAS13!